When she first met her husband, Patty Loeffler was thin, active, and the picture of good health. But nine years into her marriage, Patty found herself 100 pounds overweight and a perpetual yo-yo dieter. She had joined and left Weight Watchers so many times that she was embarrassed to even consider going back. And yet, she knew she needed to make a big change. That’s why in 2012, she made the resolution to simply “get healthy”—and the timing couldn’t have been better. In March 2012, Patty enlisted in Influencer Training by VitalSmarts. Already a Crucial Conversations certified trainer, she was excited to learn the Six Sources of Influence model for changing behavior. When prompted to identify a change challenge to which she could apply the model and principles, she selected her “get healthy” initiative. Shortly after, she received the newest book from VitalSmarts, Change Anything, which helped her further apply the Six Sources of Influence to her personal goals. 1. Make a plan. Patty found planning to be essential. She not only planned her healthy meals, but also where she would go if and when she ate out. She learned where all the healthy restaurants and meals were in the city so she would never have to make a last-minute unhealthy choice. 2. Weigh daily. By weighing herself daily, she found that she could stay on top of her weight loss and most importantly, quickly get back on track if she started slipping. Patty used all six sources of influence to help keep her vital behaviors, but she attributes the majority of her success to social motivation and ability. She says the social influence that was missing from her past diet attempts meant the difference between her success and the years of failure. 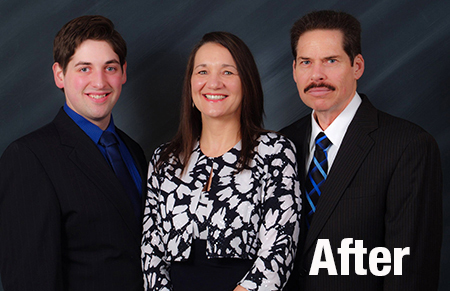 Patty recruited her husband and son to join her in her goal to get healthy. Like Patty, her husband also had a history of failed weight loss, and as a result, was pretty reticent to participate. But after Patty begged him, he agreed and they made a very serious commitment to each other that they would see the plan through to the end. Personal Motivation – Patty hung her skinniest jeans on her closet door which served as a daily reminder of what she looked like and how good she felt when she first met her husband. The jeans also reminded her that at the age of 53, her window of opportunity to change was closing as she may only face more health issues in the future. Personal Ability – A key part of Patty’s plan included a nutrition program called Ideal You sponsored by her employer. At first, Patty was skeptical this would be just another failed diet plan, but this program taught her skills to control her diet with higher protein and lower carbohydrates and fats—skills she never learned before. There was also a phased approach which began by limiting her diet in the beginning and slowly adding in healthy foods as she learned to get her intake under control. The program also taught her effective strategies to maintain her weight loss. Social Motivation and Ability – Patty and her husband faced every part of their weight loss journey together. They started by publicly announcing their diet at her daughter-in-law’s birthday party. This public proclamation lead to support from her entire extended family. Her husband also did most of the shopping under their approved dietary guidelines and they began exercising together and spent less of their time together watching TV or eating out at unhealthy restaurants. Patty also garnered support at work. She teamed up with a few coworkers who also had a goal to get healthy and they spearheaded a transformation of their entire team. For example, they stopped bringing in unhealthy food to celebrate events and when they ate out together, they went to healthy restaurants. Patty’s family and friends never made her feel bad for wanting to choose healthy meal options. On the contrary, many actually thanked Patty for her example and motivating them to make their own healthy choices. Patty also attributes much of her success in beginning an exercise regimen to the help of personal trainers who reintroduced her to exercise and how to do it effectively. Structural Motivation – Instead of falling into old habits of rewarding herself with her favorite foods, Patty started going to the spa and treating herself to massages, manicures, and pedicures when she hit her weight loss goals. She was also really motivated to change by shopping for cute clothes she couldn’t fit into previously and the money she saved from giving up expensive and fattening fast food meals helped to offset the expense of a new wardrobe. Patty was also motivated to stick to her new diet because it was a plan she paid to be part of and she didn’t want to see that money go to waste. Structural Ability – Early on, Patty decided to chart her weight loss. This strategy helped her to see her long-term success—which was a tremendous motivator during the weeks of plateau. She also changed her surroundings. She brought exercise equipment out of storage and placed it in her family room. She also got rid of all the junk food in the house. She even made changes at work. For the first time in her career, she began to use the on-site personal trainer and fitness center provided by her employer. By using the change plan found in Change Anything, Patty shattered a long history of failure to lose weight. In just nine months, she lost an impressive 102 pounds. And, as it turns out, her weight loss impacted her life in even more immediate ways. After discovering a life-threatening illness months into her get healthy initiative, doctors told her that losing the weight was the best thing she could have done and possibly even slowed the progression of the disease thus allowing it to be discovered and treated at an early stage. Patty wasn’t the only one who experienced such dramatic success. The social influences she learned about in Change Anything really made a difference not only for her but also for her husband and son. In the end, Patty’s husband lost 80 pounds and her son lost 100 pounds, proving that with the right plan, you really can change for good. What a wonderful, inspiring story!! Thank you for sharing so openly and thanks especially for the pictures. Wow! Patty, Vern and Ryan, Your success is an awesome testimony of your strength and courage. I cannot believe how great you all look. You inspire me!